Captain Christopher Rynd was born in New Zealand and grew up in Singapore, Sri Lanka, and in islands Fiji and Samoa of the tropical South Pacific. 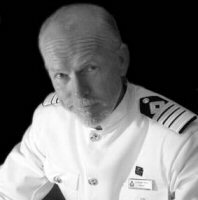 He began his sea career in 1970 at the age of seventeen in New Zealand and after completing his cadetship joined his first passenger vessel, the S.S.Oronsay of P&O Lines. His early days at sea were in P&O's vessels on routes between Australasia and the United Kingdom combined with cruising. Since then most of this career has been in passenger cruise ships on world wide itineraries which now include most of the world's cruising destinations and liner ports on every continent except the Antarctic. He combined this with eight years as a reserve officer in the British Royal Navy. Rynd gained his qualification as Master in London in 1979. Previous commands have been in the P&O Princess cruises fleet including the Royal Princess, Pacific Princess (both the original vessel that 'starred' in the 'Love Boat' television series which in turn lead to the growth of cruising as a vacation and the latest ship to bear the name, which he brought into service for Princess Cruises). Also the Regal Princess, Pacific Sky (based in Australasia and the last steam turbine vessel to see service in the fleet), the new Sapphire Princess (116 000 Gross Tonnes and introduced into service in 2004,) before being appointed to the Queen Elizabeth 2 last year. His two appointments in QE2 were in cruising European waters and the first half of her annual world cruise. In this time he came to appreciate the distinctive product that is Cunard and when asked to command the Queen Mary 2 was both honoured and delighted to accept. Rynd is married and his Australian wife Julie travels on board as much as home responsibilities allow. This has recently been made easier now that the youngest of their three children has left school. When not aboard they spend time in both Britain and Australia but visit New Zealand each year to hike and fish trout.